I coughed out and woke up. "I came here as you haven't found me even after long. I'm the being who was called the king of Minoa. Let me tell you about Cattle human. Seat cattleman told atoms to become Cattle human. Seat cattleman thought Minotaurus would be respected by everybody. Therefore it told the atoms to turn into Cattle human and Cattle human were born. However Stone humans didn't revere them, as the figure of Cattle human was ugly. It was not good because the horns of cattle was made by imitating the tubes for sucking the juice. The gene of Stone gods was told to become the figure of the cattle. The direction which made the tube for sucking the juice project on the head was given." #)A reader of my site introduced Nut in Egypt by E-mail. Though I saw the real picture(facsimile? ), unfortunately I failed to take a picture of it. This picture shows Northern Hemisphere and Southern Hemisphere. Nut means Neu of Stone god extended like the membrane and wrapped up the earth. The upper part of the picture shows Northern Hemisphere in which there are lots of humanity, who traded by ship. The figure which show the form sitting in a chair show there are Stone humans who were dominated by Chair seat. (Small Stone humans are lining up in a row in the upper most part of the picture, five ships are drawn upside-down in the next row. Many Stone humans are drawn in the next below row and a Stone human around the center is sitting on a chair. The four black tubes that lead up and down show underground cavities are connected with North Pole. The figure of goddess whose head(on the right side)is covered with cloth(?) show Japan. The stars in the above body of goddess show the subconscious mind comes from stars. The below goddess show Southern Hemisphere. The red circle show the sun. 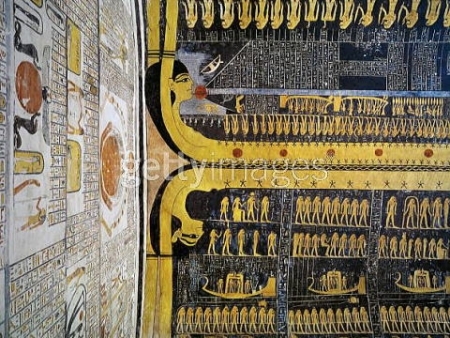 It also shows there are many people who worship Sun god Ra. The thing like the door in the center show there is inner universe. There are many big Stone humans in the lower part of the picture. The three Stone humans in the center hold swords, which show Stone humans of the South Pole are protecting the entrance to the inner universe firmly so that bad being should not enter into inner universe. The boats in the lower part are less than those in the upper part show there are less humanity in the Southern Hemisphere. The thing in the center show connected Stone humans are surrounding the earth thinly and widely. The picture of birds show there are many birds in Southern Hemisphere ( as in Australia and Africa). The gray color which extends from the front part of the face of the goddess expresses the life after death. This picture shows the earth which humanity realize the meaning of the picture some day.